Introducing a new artist interview series by Daniel Samaniego. In the first of the series, which will focus on issues in contemporary painting and drawing, he interviews fellow Bay area artist Katherine Vetne. Katherine Vetne's current work draws from the imagined consumerist desires of a kind of alter ego: an upper-middle class, suburban woman, brimming with over-the-top heterosexuality and striving for the ultimate normative identity. The artist first unearthed this alter ego by perusing the contents of online wedding registries that were listed under her name, but belonged to strangers. 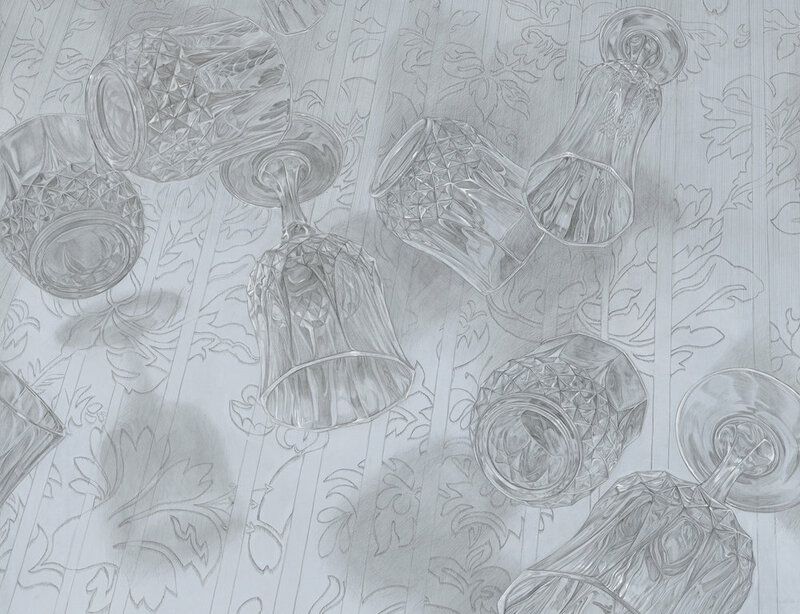 The impetus for this series, Vetne purchased a piece of Waterford crystal listed on one of the registries and drew it from life in metalpoint, a technically challenging and labor intensive Renaissance-era medium which requires a drawing stylus made from solid silver or gold. DS: Drawing carries a lot of baggage: it’s esteemed for what it is, but sometimes punished for what it lacks: paint, color? But isn't drawing its own beast with its own problems and outcomes? Because I am also working with drawing as a primary medium, as are you, I think I understand what drawing must mean for you. We’ve touched on this during studio visits, but to unpack: why drawing and what about the parameters of drawing gives your work the beauty it has? 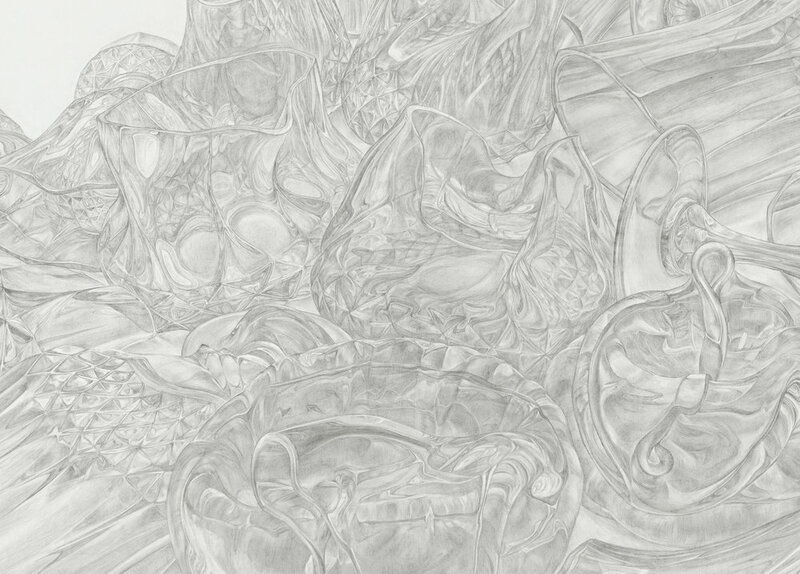 KV: The thing I love most about drawing is that it is about creating complexity from a place of limitation. With drawing, you arguably have fewer mark-making possibilities at your disposal than you do with painting, and your challenge is to build a convincing form despite these natural limitations. Sure, there's a wide range and variety of drawing materials out there, from graphite to charcoal to colored pencil. And yet, there's something about the kinds of limitations drawing is typically associated with (for example, dry media, lack of color, and line) that I find I am really attracted to. On the other hand, the possibilities of painting seem more infinite (fluidity, color, viscosity, transparency, opacity, brush size, etc.). It's that challenge of working from a place of limitation, rather than infinite choices, that I find so appealing about drawing. In a way, the reason I love working with silverpoint and goldpoint so much is because it seems like the most limited drawing media out there. It produces the finest line, and is incredibly consistent. The values never get that dark and are hard to keep really light, and the marks don't erase easily or smudge like a pencil would. 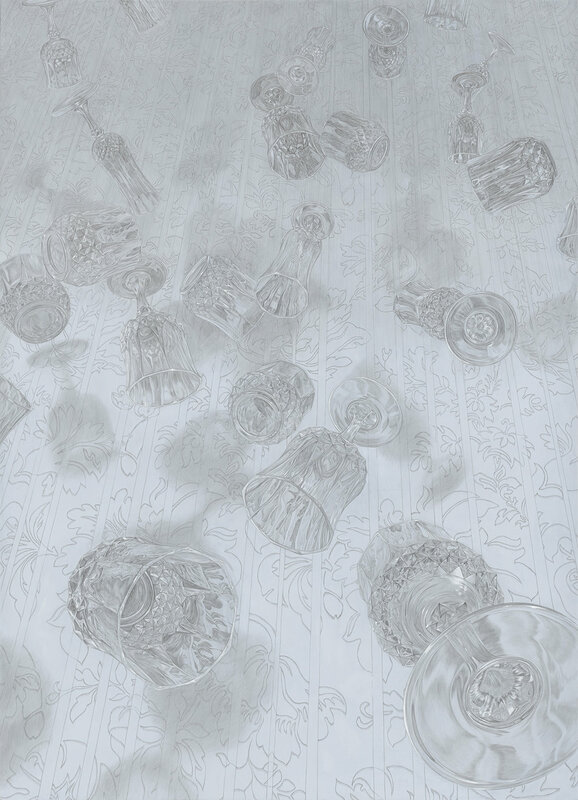 When working with metalpoint, your entire mark-making vocabulary consists only of fine, delicate line. I use this limited medium, and then choose the most complex subjects I can think of: piles and piles of shiny, clear lead crystal, some of which is melted almost beyond recognition. Then, my challenge is to draw the most complex thing I can think of with the most limited mark-making tool I can fathom. It's an addictive challenge. DS: Obviously drawing involves color too. When it doesn’t, form, draughtsmanship, or shall we say badassery can take over. How would you frame your attitude toward the surface? With so much good art being made everywhere, what in your view pushes beyond the surface? KV: I love the idea of form and draughtsmanship as badassery. It's true, there is so much good art being made everywhere, and it takes such a wide variety of forms. I think the best art is impressive on several levels, rather than just one. For example, painting and drawing that is technically impressive, but isn't conceptually rigorous, does nothing for me. When I see works that are conceptually interesting but exist primarily for the purpose of being cool ideas, I feel distracted by unanswered questions about the purpose of the form. My favorite work seems to be art that excels in many ways, all at the same time. I also sincerely feel like the best artists are the ones who deeply question the social status quo. Unpacking the social dynamics of qualities that are typically marginalized in our culture, be it race, gender, class, sexuality, or radical leftism, allows one to see aspects of our society that most people, even in the art world, are blind to. I believe in my heart of hearts that those who can observe our culture the most critically, from a bird's eye view, have the capacity to make the best, most interesting, and most provocative art. DS: I’ve always deeply felt that drawing is performative, which somewhat wearily implies the feminine. Does drawing mirror or dissolve the trappings of gender? What is the role of performance in your work? 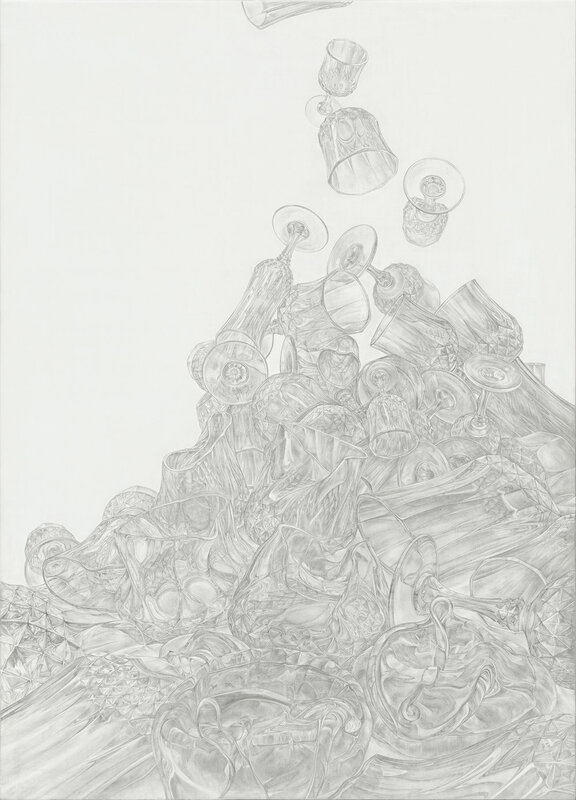 KV: I think all art is performative, but I think that the performance of making repetitive, labor-intensive work, which drawing often is, implies the feminine for some people. I am not sure why this is exactly, but it was something I noticed in grad school when I saw a pattern of people turning up their noses at that specific kind of making. My thoughts on this are varied and complicated, but for now, I will just say this: in an era in which our increasingly predatory country is being run at breakneck recklessness by nauseating levels of machismo, then yes, please, sign me up for the association of laborious care, repetition, and diligence to the feminine. One need only to look around to our current political state to realize that the association of (normative, traditional, mainstream) masculinity should, logically, be associated with incompetence. Therefore, the "feminine" (or the non-normative) must be associated with excellence. What else could one possibly call it? So if my art-making techniques seem "feminine" to anyone, they are correct: my techniques are symptomatic of excellence. Originally from the East Coast, Katherine Vetne received a BFA from Boston University and an MFA from the San Francisco Art Institute. Her still-life based practice revolves around a simultaneous criticism and exaltation of cultural expectations of mainstream American womanhood. She is also a community leader, and has formed artist collaboratives such as The Boston Critique Group. She is the recipient of SFAI’s Graduate Fellowship in Painting as well as the Allen B. Stone Award. She has exhibited her work in Boston (Samson Projects, 808 Gallery), Los Angeles (Angles Gallery; CB1 Gallery) and San Francisco (2nd floor projects), where she currently lives and works.